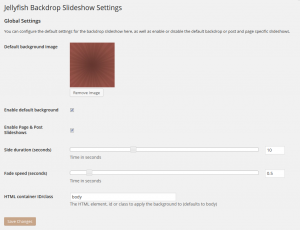 This plugin for WordPress will allow you to have a full screen image backgrounds and background slideshows that adapt to the size of your browser window. You can either use it as a global background that will be displayed on all pages and posts of your WordPress website or you can give individual posts or pages their own specific background – great for giving parts of a website a whole different look. Creating a high impact background slideshow is as easy as selecting several images from the media browser and assigning them to a post or page with the new easy to use Backdrop Slideshow panel on the post and page edit pages. Need a more traditional slideshow? No problem, you can now make a Jellyfish Backdrop image or slideshow appear within any page element, not just the body background. The plugin is changing the background on this page (look above and below this content area), it’s also adding different backgrounds to various sections of StrawberryJellyfish.com. After the plugin is activated you’ll find a new Backdrop Slideshow settings page under the Settings menu of your WordPress admin. Here you can configure the global options. Use the button to upload a new image or to select an image from your WordPress Media library. This image will override any theme background and appear on every page of your website. You can enable or disable the default background using the checkbox. Just check the appropriate boxes to enable backdrop slideshows wherever you need them on pages, posts or any custom post types your blog uses. The slideshow admin panels will only appear on edit screens of the type you select here that you have selected. Set the default length of time in seconds that an image is displayed for in slideshow mode. The length of the crossfade transition between images (in seconds) set to 0 to disable the crossfade. If you want to display images or a slideshow somewhere other than on the page background you can provide the id or class of another page element here. Jellyfish Backdrop will apply the images as a background to the element you specify and they will scale to fit this element. When the plugin is activated you’ll find a this new panel on post and page edit screens. It allows you to easily build a post specific background (or slideshow if you choose multiple images). You can also adjust the slide duration and fade speed for this specific post. Use the Add button to add a new image, like on the main settings page you can either upload a new image or use the Media Library to choose a previously uploaded image. Add as many image tiles as you like using the Add button, if you want to remove one just click on the X. You can also reorder the images by dragging them by the order icon in the bottom right of the image panels. Once you have added your image or images, remember to save the post as usual, changes to the Backdrop Slideshow will not take effect until the post is saved. Jellyfish Backdrop is available for download through the WordPress plugin repository, or alternatively search for it by name and install directly on your WordPress plugin admin page. Refactored the whole plugin into classes. To use a background on a specific page you need to add a custom field under the post/page editor. The custom field must be named: background_ image and the value should be the full url of the image file you want to use. This plugin does not have a widget or a shortcode, are you talking about another plugin? Hi Rob, just wanted to say thanks for creating such a great, easy to use plugin! I’ve just implemented it and found your instructions really easy to use. I do have one tip for wp users – remember that if you can’t see the ‘custom fields’ editor on a page or post, just check your screen options and select ‘show on screen’. Thanks again Rob! Glad you have found a use for the plugin. Good point about the custom fields, I forget they can be hidden away! Thanks for taking a moment to share. Hi, I’m glad you put up this plugin – a real time saver. Thanks a lot. Was wondering whether you could help me with that; trying to build a JF background slideshow on a wordpress site that has a category-based navigation (i.e, each category has more or less five images to loop through, and that given array of images should be shown as bg loops on every post belonging to a certain category). Hi Alessio, I’ve not tried using the Advanced Custom Fields plugin and can’t say if there is a problem there. Have you tried adding the image fields in the standard WordPress post editor? (If you can’t see the add custom field box first click on the “screen options” tab at the top of the editor page and ensure that “Custom Fields” is checked. WordPress definitely allows multiple custom fields with the same name entered this way. Hope this helps. it worked before I could even say ‘Hey, struth mate’! can be the Jellyfish Backdrop plugin enabled for events too? I use post-like pages from the Event Organiser, it shows many other plugin extensions (SEO,…) but not the Jellyfish Backdrop plugin extension for post editing. The plugin currently only supports Posts and Pages but I’m planning to allow custom post types in the next release, this should world with Event Organiser. Great plugin but haven’t been able to get the “Add” button. Have followed your instructions “screen options” tab at the top of the editor page and ensure that “Custom Fields” is checked, but the option is not even there. If you don’t see Backdrop Slideshow box under your post / page editor then go to Settings > Backdrop Slideshow and check that post, page or whatever post type you want slideshows on is checked in the Enable Page & Post Type Slideshows section. Hope that helps, Let me know if you are still having problems. Is there a way to have the default background apply only to pages with a particular body.class? I have set backgrounds for each of my blog posts, but I can’t find a way to set a background for the Category or Tag Archive pages. It works if I set a default background, but I also see that it then flashes the default background on other pages (like Home) before my theme has a chance to load its own background image. I would prefer not to see this flash (and save the bandwidth as well). My theme assigns the .archive class to the body tag of Archive pages. I have tried setting the Global Settings -> HTML container ID/class to body.archive (and .archive), but it still loads on the non-.archive pages. Am I doing it wrong, or is this not possible? You had the right idea, using body.class should work. But it seems that was broken in 0.6.6 as the post type container classes were overriding global settings. I’ve just uploaded a new verion, 0.6.7 which will fix the issue and hopefully your problem. Just found your plugin and hoping to use it, but I’m getting “Warning: Invalid argument supplied for foreach() in /…/client/wp-content/plugins/jellyfish-backdrop/jellyfish-backdrop.php on line 103” immediately on loading a page. Are you using the most recent version of the plugin 0.6.7 ? There was a bug in 0.6.5 that gave a similar error. I took a look at your site and didn’t see the error message, maybe you’ve already found a solution? Hmm, that same error is happening over here, with version 0.6.7, have a look at http://enjoyourpark.com the error pops up at the bottom of the page below the the footer. Thanks for confirming the problem Adam. Shout out if you still have problems! Even though it was saying 103. Of course I’m like a bull in a china shop, will try the fix now! Thank you! I really love this plugin! Really awesome, because it allows me to decorate my site *almost* the way I’d like it! Honestly, I’m sort of a noob… but there was something I was hoping the plugin could do for me. I use this plugin combined with text collapsing/expanding features on individual pages. And I decorate the “div#content”. When I expand text, it doesn’t automatically show the “remainder” of the image loaded into the slideshow. So it shows a part image and part blank. 1) Is there any way you can make it work where it loads the full image anyways, or automatically adds the missing image when more content is expanded? 2) Force the (div#content) page to maximize itself (relatively) to the screen resolution, and lock the background image loading. This way the text “hoovers” over the image, and you can scroll to read all. Hopefully you can add the functionality I’m looking for! 1. The image will be sized to fit whatever it is put in when it first loads, it may be possible to trigger some kind of resize event when your containers expand, but it’s hard to say how easy that would be without knowing you exact setup, it sounds like more of a case of tweaking behaviour to work with your particular them and requirements than a feature of the plugin itself. Hi Rob. I’m sorry. I was talking about the jellyfish counter. Accidently posted in this topic. I think it’s a greast plugin, and there’s almost no plugin like this one. Maybe powrhit, but powrhit plugs it’s logo into your site. It’s just a pity that jellyfish counter isn’t compatible with the newest version of wordpress.mmaybe that’s why it slows down my site a bit. Otherwise it’s a grenst plugin. Can you tell if this plugin works with Headway Themes? Look forward to working with the plugin and I really appreciate how responsive you are to questions. Thanks in advance. I just downloaded Jellyfish Backdrop and love it so far. I am wondering if it’s possible to make the background scroll instead of fixed? Tried a little css with no luck, and I looked around in support and didn’t see anything. Is this possible? Sorry, scrolling isn’t supported by the jQuery code that this plugin uses.